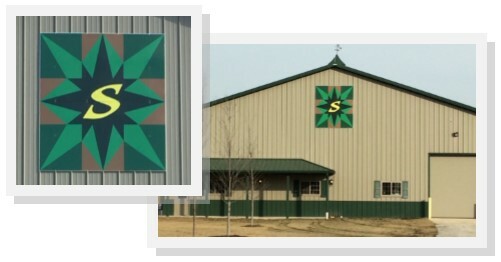 There are three barn quilts on the Sterrenberg Farms in rural Chatsworth. Two 8′ x 8′ barn quilts are most prominent. The one has the “S” in the middle, naturally stands for Sterrenberg. Casey Sterrenberg had this done for his mother (Shari Sterrenberg’s) birthday. Casey is the fourth generation family farmer in the Charlotte-Chatsworth area. The other barn quilt is the Mariner’s star in memory of Lucas Stork. Lucas was a shining star to the Sterrenbergs and orange was Lucas’ favorite color. Lucas passed away November of 2012. He was Casey Sterrenberg’s best friend. The third one is Shari’s “personal” one that is close to the grain bins. You will need to drive past their place to see for yourself! This one is a 4′ x 4′ size. It shines with the sun, moon, and stars. Hope you can go for a ride in the country! !